This left hand damping technique is vital to getting the clipped, staccato sound that characterises this style. With plenty of practice the "squeeze and relax" becomes a completely natural part of the rhythm. You should practice very slowly at first until the timing of the damping is firmly established. Playing at full tempo is then much easier having all the moves co-ordinated. 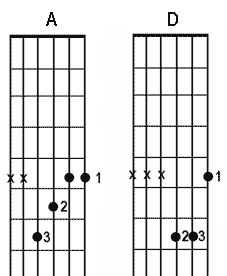 I have tabbed out the figure I play at the end of the video plus diagrams of the abbreviated chord shapes used. These small shapes work well for traditional Ska but for Ska-punk you may find full barre chords are required.